Doesn't it seem a shame to peel an orange and just throw those peels away? I'm something of a fanatic about using every last little bit. (No kidding?!) I can only make so much candied orange peel, and save so much orange zest. Sometimes I just want to prepare an easy recipe, that will use the orange peel as well the the pulp. And this is the one I use. This is another one of my friend Jayne's recipes. She's the source of my rhubarb pie recipe (Jayne's Rhubarb Custard Pie) and zucchini bread and butter pickle recipe. 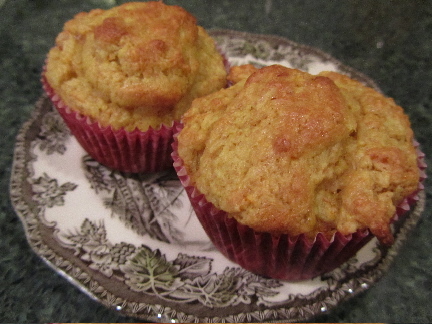 The official name of the muffin recipe is Orange Muffins, but when my kids were very young, they dubbed these Sunshine Muffins. So, Sunshine Muffins it has been. I hope you try these and let me know what you think. Wash orange either with a drop of dish soap or in a vinegar wash. Cut orange into 7 to 8 pieces. Remove any seeds. Combine orange and juice in a blender. Puree. Add egg and butter to blender, and puree. Pour into a large mixing bowl. In another bowl, measure dry ingredients. Mix thoroughly. Pour over the top of the orange mixture. (Add optional dried fruit at this point.) Stir just until combined. Fill greased muffin cups 3/4 full. Bake at 400 degrees F (204 C), for 20 minutes, or until tops spring back when pressed. Cool in an for 5 minutes, then remove. Yields 12 to 16 muffins. What ways have you come up with, to "use it all up"? 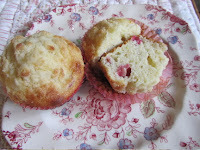 If you enjoyed this recipe, you might also like my Rhubarb Crumb Muffins. Tender muffins, with a crumb topping. You really like using up all of oranges, don't you :) I'm getting so many great ideas. these muffins so freeze pretty well, as they're somewhat dense and moist. I've almost exhausted all my usual ways to use the whole orange! A whole orange cake sounds delicious. Was this an iced cake, or a tea cake? This is obliquely related to your question of using something up. I had a college roommate who ate the entire apple--seeds and all. This was her regular way of doing it and she never suffered any ill effects. However, I have not picked up her ways. I really don't like the texture of the core. how very, um, unusual of your former roommate. I'm not sure I'd care to eat the core, but maybe it's an acquired taste. I had always picked out and thrown away watermelon seeds, then one day I noticed that my stepmom just eats the seeds along with the melon. So I figure there are probably nutrients in those seeds, and eat them too. But with apples, I think I've read somewhere that eating a whole lot of apple seeds was not good for a person, but that's probably huge quantities that would have ill effects. Have you heard this about apple seeds? My mom said that, having grown up in the depression era, she used to eat the whole apple as well, but I think I'll just enhance our compost. I can't remember where I read it, but I think watermelon seeds can be roasted much like pumpkin/squash seeds. I have a hard time finding watermelon that isn't seedless, though. I can find seeded watermelons at our produce stand nearby. I buy them because they're usually 10c per pound cheaper than the seedless. But otherwise, you're right, the grocery stores just carry the seedless varieties these days. Apple seeds contain cyanide, so it's wise not to eat them, although the amount in one apple is unlikely to harm anyone. Oh, I know what I'm going to try and bake this weekend! I hope you enjoy them! Perhaps in your area you could use a hefty dose of Vit C this month. Is the flu hitting hard at your office? Between this and the citrus infused vinegar I may never have orange peels to waste again. I never though of doing this, sure we ate candied orange peel, but baking it in things never entered my mind. Just me and my waste not, want not ways! Seriously, though, these muffins are a treat for our family. Hope you have a nice weekend! Do you have plans to see your grandchildren? Now that sounds clever! My mom used to put pureed sweet potatoes in orange peel halves at Thanksgiving. I carry on the tradition here in our family many years.